NuVet prevents and reduces the risk of Heart Disease, Liver Disease, Eye Tearing,Diabetes, Premature Aging, Cataracts, Tumors, Arthritis, Joint Problems, Improves Lethargy, Allergies, Skin and Coat Problems, Dry Flaky Skin, Scratching, Itching, Biting, and More! Overall, Nuvet prolongs life, strengthens immune systems and vital organs. Pets can suffer from Allergies, Skin problems, Digestive issues, Joint aches and all manner of organ and glandular failures. Many canines and felines, especially when they get older, have health issues just like their senior counterparts. It’s very common for older dogs to have Arthritis and come down with eye cataracts. Many pets will be the victims of Cancer and have to undergo similar treatments as humans experience. Nutritional supplements like NuVet Plus, that contain a rich supply of vitamins, minerals and essential enzymes offer a matrix of antioxidants and amino acids. These ingredients help protect your pet’s body from opportunistic organisms, free radicals and chemicals that can harm them on a daily basis. Formulas that contain high quality minerals, a full range of amino acids, proteins and antioxidants – help to detoxify the blood stream. Keeping the bloodstream clean allows for red blood cells to carry nutrients vital in defending against infection. Companies that use human grade ingredients combined with manufacturing operations that are approved for human products production by the FDA. This equates to a supplement that goes beyond mere commercial value. It shows a company that puts the health of your pet ahead of everything else. NuVet Plus® is guaranteed for purity, safety and effectiveness. 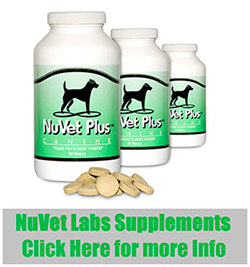 As one of the oldest and most respected companies in the pet industry, NuVet Labs® proudly stands behind it’s supplement with our 60 day 100% satisfaction guarantee*. Providing reliable service to our customers since 1997, we have helped hundreds of thousands of pets in their quest for health and vitality. I started researching vitamins 8 years ago this past March because I was having major issues with my Yorkies’ gastric systems. In April of 2006 I decided I wanted to try NuVet Plus and I am totally convinced it was the right choice. Since starting NuVet I have not had one incident where I have had to take any of my breeding/show or pet dogs to a vet for gastric or health issues. I believe we have built up a Strong Immune system and the things that might have upset them in the past no longer get them down. I start my puppies immediately when weaning (powder form) and of course what they get from Mom. Prevention saves you money on medical bills! Bottom line! 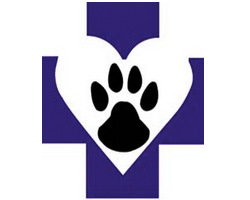 The headache and heartbreak when a pet gets sick can be minimized when proper nutrition, excersize and care is given. With NuVet, you are able to reduce cancer causing free radicals and give your pet the antioxidants it needs to stay healthy. The Automatic shipping program will give you a 15% discount. The convenience of having it sent on time and automatically will ensure your pet never misses a dose. Worry free, convenient, and saving money is what it’s all about. With a money back guarantee and hassle free customer service, you never have to worry if you want to cancel the account or simply don’t like the product.